Valentines Day Post: 14 Things I LOVE! Hello hello!! I'm baaaaack. It's been a minute. I literally think that is what I say every time I write new blog post hahaha but whatever. Life is freakin' busy and I've just been focusing on me lately. February is one of my favorite months because of Valentine's Day! Now I know 80% of people literally hate this "holiday" but I love it and think it's so cute & fun. I like to plan something nice for my husband and make him feel love & appreciated. And yes.... I make him feel loved and appreciated on the daily... but it's just fun to have a day to do be all lovey dovey! 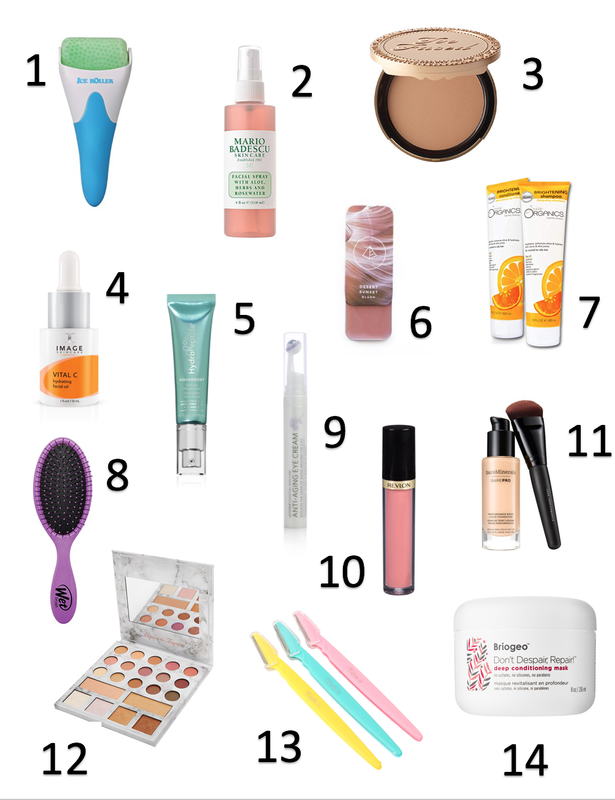 Since February is the month of love, I decided to put together a blog post sharing 14 (cuz Valentine's on the 14th....) beauty products that I have been using lately that I LOVE and want you to LOVE too! Hope you enjoy! 1. My favorite ice roller: If you've been following me on instagram for a minute, you know I rave about ice rolling my face. I do it morning and night and I am OBSESSED. Having an ice roller makes it so much easier than using ice cubes and having water dripping down your whole body. It has SO many benefits (increases blood flow, tightens pores, reduces swelling, etc.) and has helped my acne dramatically. And it is only $12! 2. Mario Badescu Facial Spray: I absolutely love this stuff. I put it on right before I ice roll my face, after I ice roll my face, after I put my makeup on, 5 other times throughout the day, and so on. You get the point. It feels amazing, smells amazing, and keeps your skin feelin' so fresh so clean! 3. Too Faced Chocolate Soleil Bronzer: I've had this bronzer for over a year and still have SO much left. Aka a little goes a long way! This stuff is the perfect "bronze" color and it legit smells like chocolate. You need it. 4. Image Vital C Hydrating Oil: I put on this hydrating oil every night after I ice my face and before I moisturize. I was super sketched out to use an oil on my face because I thought it would make me break out more but it did the exact opposite! It really helps speed up the "healing" process of acne and leaves your skin feeling so soft! It is a game changer for sure. 5. Hydropeptide Moisturizer: Okay... long story short.. one of my besties got this moisturizer at a trade show she went to and it didn't workout for her so she gave it to me and it literally changed my skin. Yes... it is pricey. But to me clear skin is worth every penny! It has also made my skin feel tighter, firmer, and brighter! However I know everyones skin is SO different... this just worked great for me! 6. Maskcara Blush in the color Desert Sunset: I did a collab with a maskcara artist a few months ago and although I don't wear the products everyday, I wear the blush everyday! I am obsessed with the color and feel like it has such a glowy/dewy look to it. Also it doubles as lip gloss. It's a win-win. 7. Juice Organics Shampoo and Conditioner: I've been using this stuff for a couple months and it is my absolute favorite! It smells amazing, makes my hair soft, and has lasted for so long. IDK how because I have so much hair... but somehow the bottle never runs out hahaha. The current set I am using is the "brightening" one! I've also used the "color protect" shampoo and conditioner. Both are so great. 8. Wet brush: I'm one of those people that held onto my high school zebra paddle brush for WAY too long. I was literally ripping through my hair every night and was seriously concerned that I was going to go bald haha. I then had a friend recommend this brush to me and it changed my life! If you don't have this brush... go buy it now. I have the most sensitive head and this brush is so gentle and runs through your hair like butter. 9. Doterra Anti-Aging Eye Cream: Sooo I am apart of a "doterra membership" type thing so I have tested out A LOT of their products and I literally am obsessed with so many of them. However this is one of my favorites! It is basically just an under eye cream.. but I just love how it goes on. It has a little bit of a thicker consistency and makes your under eyes feel so hydrated. 10. Revlon Super Natural Lipgloss: Who doesn't love a good lipgloss? This stuff is my absolute favorite! It's a super light pink and goes perfect over any color you are wearing on your lips. I wear it every single day! 11. Bare Minerals Pro Foundation: I am in loveeee with this foundation. It has great coverage but feels super light on and doesn't make you look like a cake face. What more could you ask for???? Also they literally have 45789307430 different shades to choose from.. so you are bound to find one that matches your skin tone. 12. Carli Bybel Pallet: I've said it once and i'll say it 1000000 more times. I LOVE THIS PALLET! It has all the colors you need plus highlighters and bronzers. Instead of having 50 different pallets.. you can just have one that literally has everything you need. The eyeshadows stay on all day and have great pigment. 100/100 recommend. 13. Face Razors: Let's get real... we all get a few mustache and chin hairs hear and there that we don't like to admit. Soooo invest (literally like $3) and get these bad boys. I use them basically all over my face to get rid of the peach fuzz... and love them. Why pay for a dermaplane when you can give yourself one hahaha. JK they probs do it better. 14. Briogeo Deep Conditioning Hair Mask: If you have some damaged/dry hair, this will be your new best friend. You just put it on while you are in the shower, leave it on for a good 5 or so minutes, wash it out, and wa-la! Your hair literally feels 10 times softer and healthier. Happy month of LOVE! 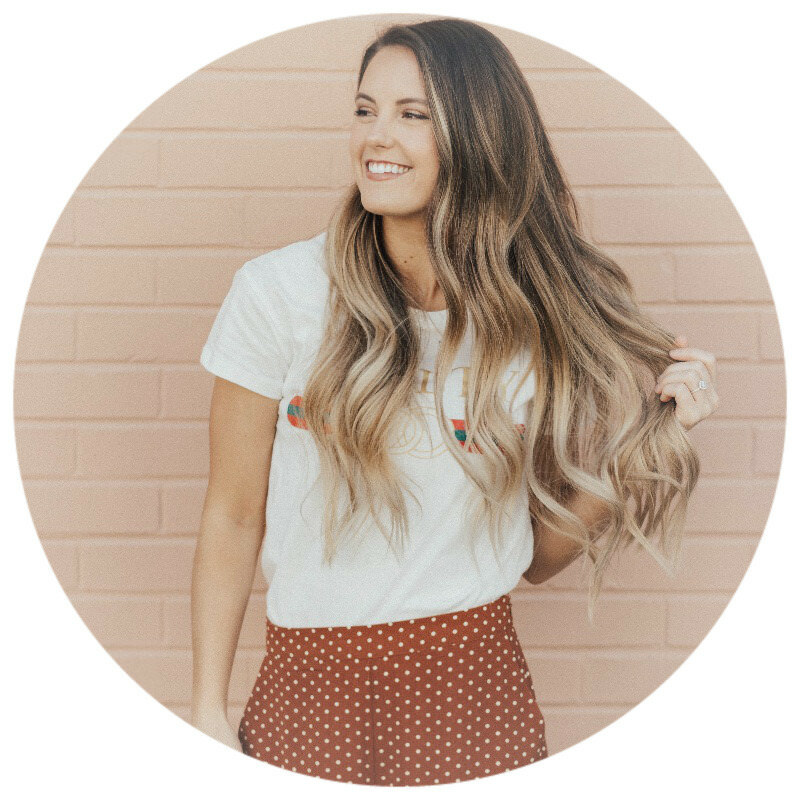 Hope you love these products as much as I do!